Steaming West from Fiji. But Not Without the Persian Fetta! The second week of March this year found us avidly following developing weather in the South Pacific from the comfort of our cozy Seattle digs. 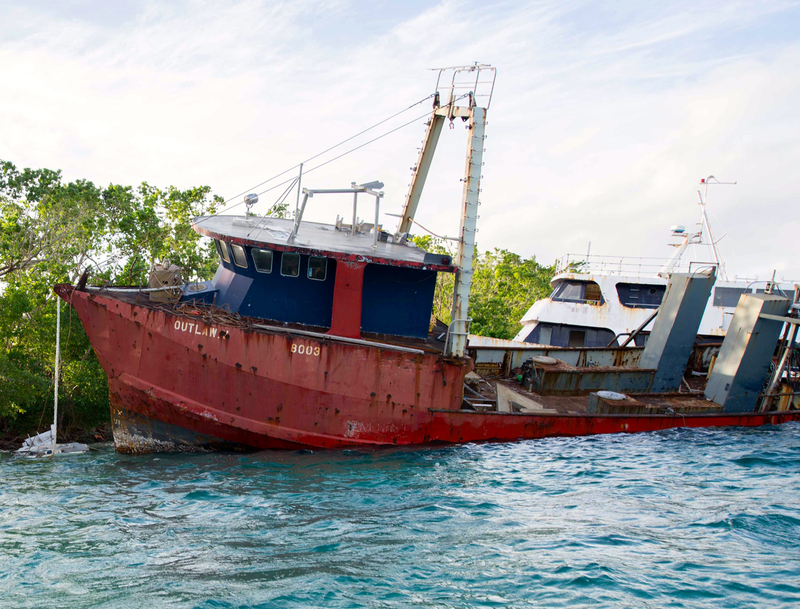 For the cyclone season, we had left Buffalo Nickel once again hauled out into a protective ‘pit’ in Vuda Point Marina, Fiji, while we visited the States. An intense tropical storm was threatening not only to up its game to Category 5, but also to hit Fiji, so we fretted about our boat. That storm did up its game, becoming Cyclone Pam, but instead of Fiji it went for the island nation of Vanuatu to the west. With 155 mph sustained winds (highest sustained winds of any storm in the southern hemisphere) and gusts to 200 mph, it wiped out power and communications in this poor nation of 82 islands. 90% of buildings were damaged, and thousands of people displaced. 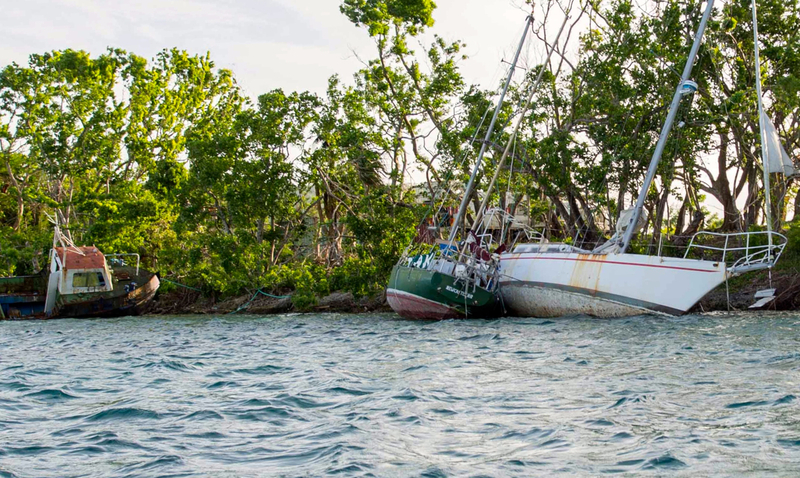 With few airstrips, most local boats damaged and storm season still ongoing, many of the islands and their villagers were cut off from all contact or aid even four days after the storm passed. Some islands were completely without fresh water or shade during that time. “So, now what?” we wondered. 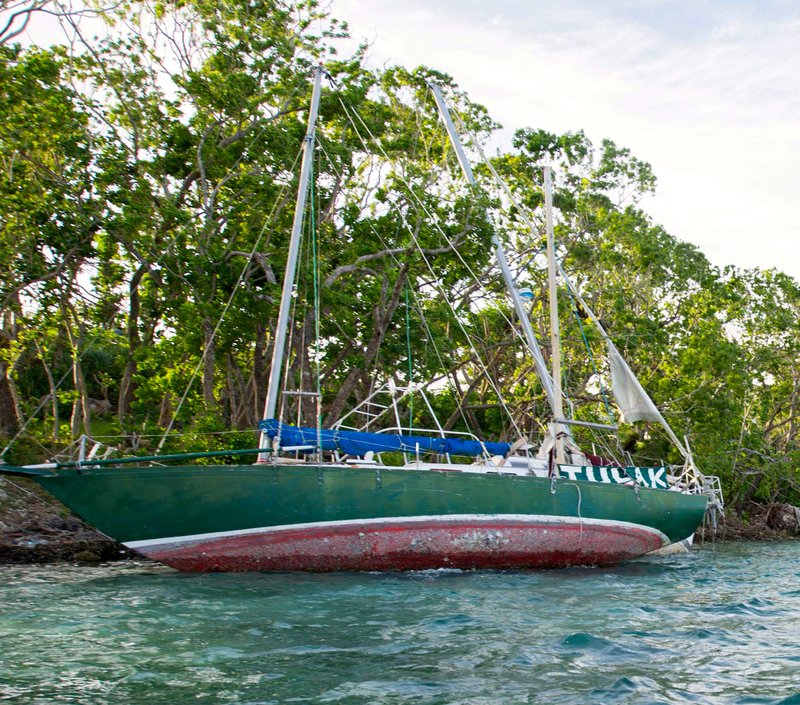 We had planned to spend some time in Vanuatu during the upcoming cruising season. Should we bypass it altogether and just make for New Caledonia, with its postcard-worthy beaches, spas, and French food and wine? Cylclones damage reefs so scuba diving on Vanuatu would be negatively impacted, along with an infrastructure that was third-world to begin with. But more to the point, we could not have slept well at night after frolicking all day in the face of their devastation. During our two seasons cruising Fiji, the people had been so generous and welcoming to us yachties. Just walk past a home in a Fijian village at mid-day, and the family will invite you in for lunch. They’ll mean it, too. 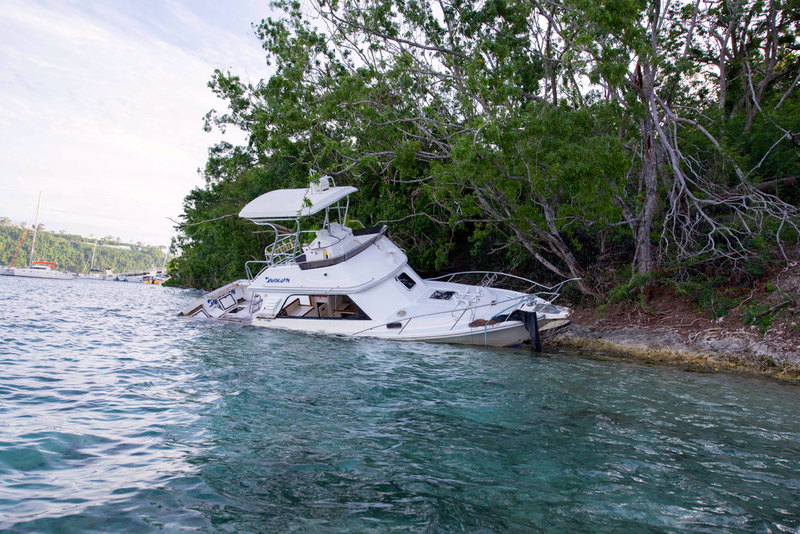 Whenever a cruiser faces a challenge – runaway dinghy, boat gone aground – the villagers are right there, dropping everything to lend a helping hand. We’d heard the people were similarly genuine and welcoming in Vanuatu. We figured this would be a good time to give something back instead of sightsee. Gotta keep the karmic ledger in balance…. or whatever it is that compels agnostic heathens like us to do ‘good works.’ We decided to spend several weeks contributing in whatever way we could to their recovery efforts before moving on to Australia and our Indonesia rally. Stan cursed (but only a little bit) and spent the next couple of days tinkering. I am pretty good with technology and electronics, but largely worthless when it comes to handiness around machinery. So I spent that time stowing provisions and prepping stuff for freezing. 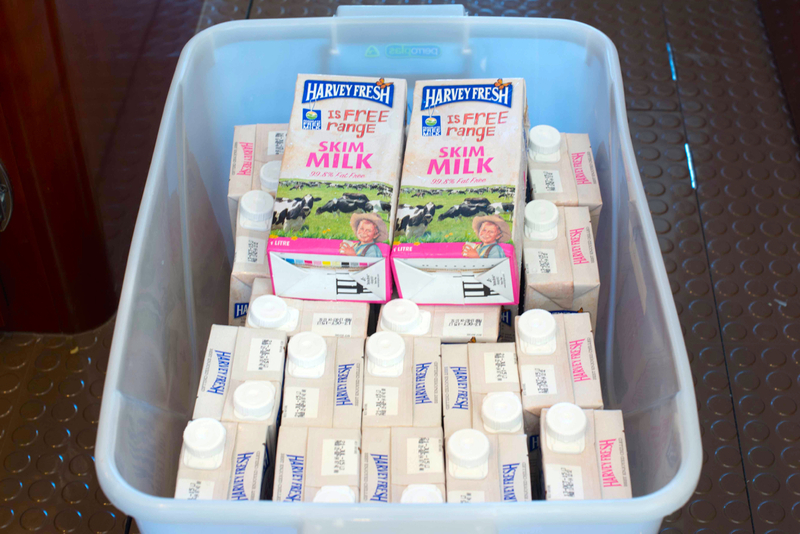 Bins of food stores like this UHT milk are stowed in the ‘basement,’ their contents recorded on a spreadsheet. Provisioning for a season in undeveloped remote areas is quite an exercise, especially for folks like us who enjoy cooking a wide variety of food rich in fresh vegetables and herbs, and drinking fine wine most nights we are not underway. We don’t care for processed food, and goods available for purchase on the remote islands of Vanuatu range from nothing to very little. 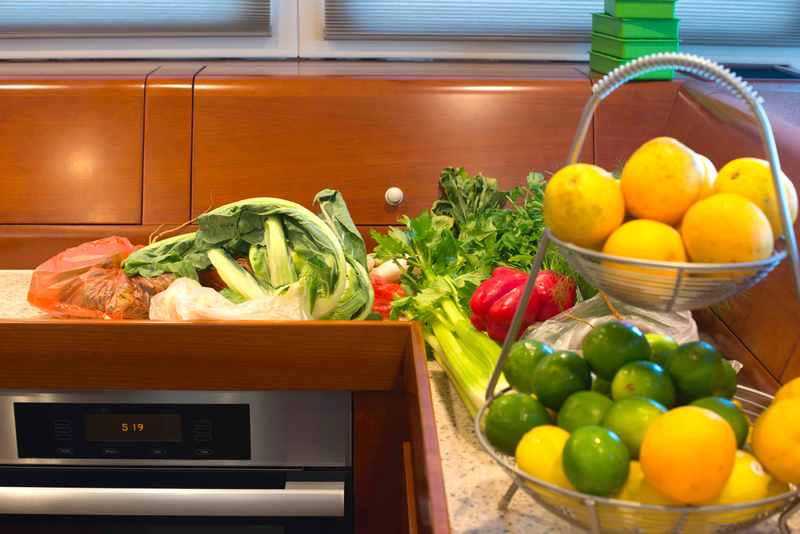 Our solution involves prepping and/or pre-cooking, and freezing. 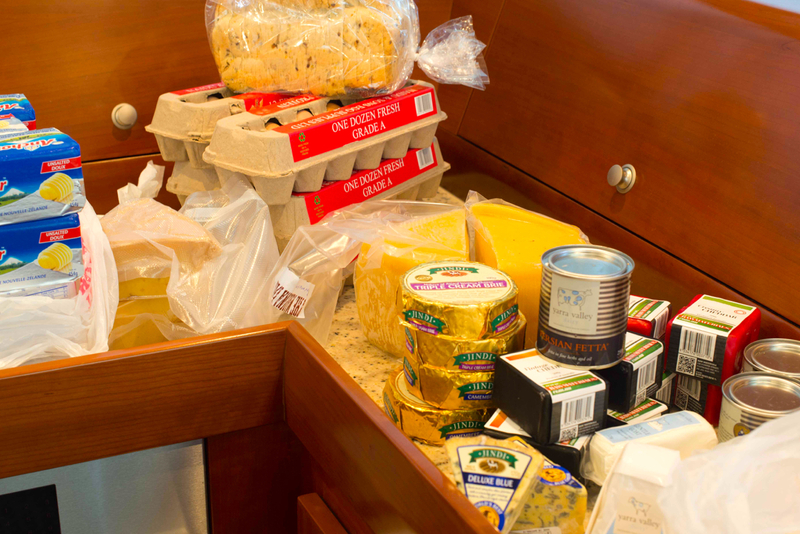 Many of the ingredients we love, like most fresh herbs and much of the produce, are simply not grown in Fiji but we were able to send our personal order through a super yacht provisioning service to get beautiful produce and cheeses from New Zealand. Score!! 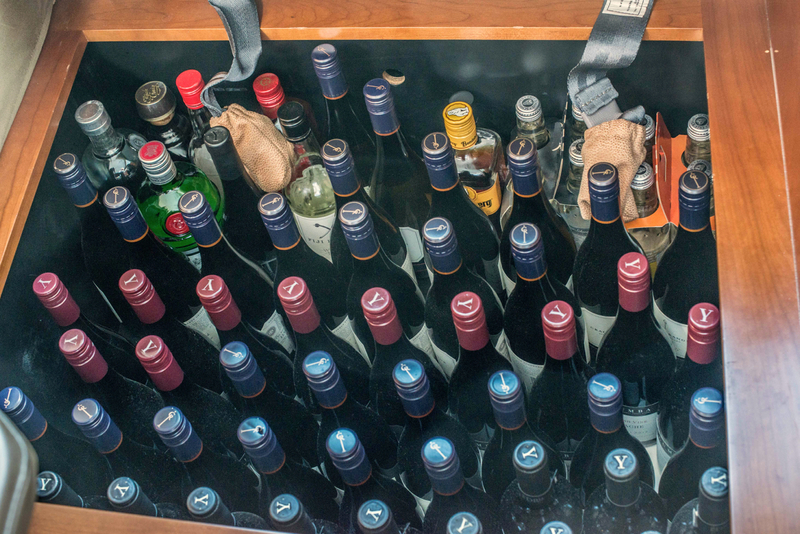 Wine and a few spirits stowed under a settee cushion in the great room. One of 3 like this, which should see us through to Australia. Freezing fresh herbs or citrus is something most of you on land would never think about, but it works well if you do it right: whole mint leaf stacks, frozen in water in ice cube trays; basil chopped with a bit of olive oil and salt , the pesto-ish result frozen into cubes; thyme and rosemary vacuum sealed and frozen in whole sprigs; lemon, lime and orange zest and juice… I had many days of work to do. And that was before I got to things like cauliflower puree, parsnip puree, veggie-rice cakes, baked eggs for easy passage breakfasts etc. With sourcing, procuring, prepping and stowing, it took nearly 14 solid days of work. But the payoff is worth the effort, all those ‘life is good’ moments, evoked by memorable meals taken while underway or swinging at anchor in some magical secluded spot. 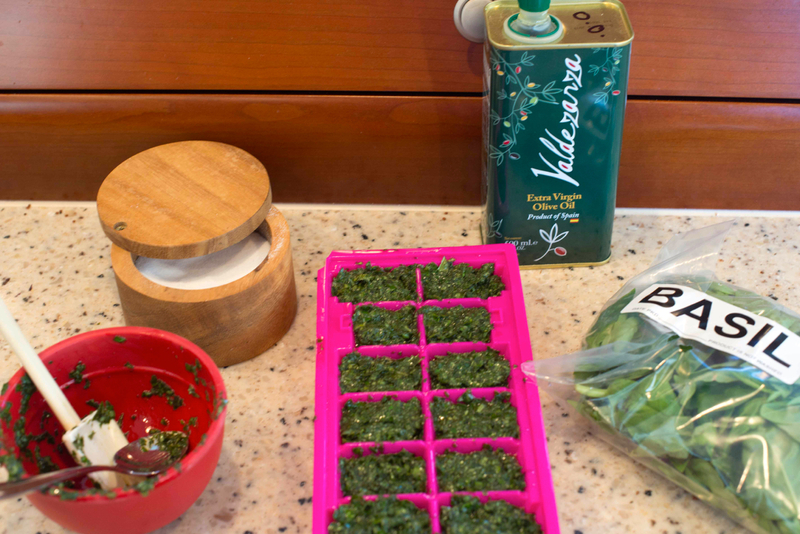 Ice cubes of fresh basil. 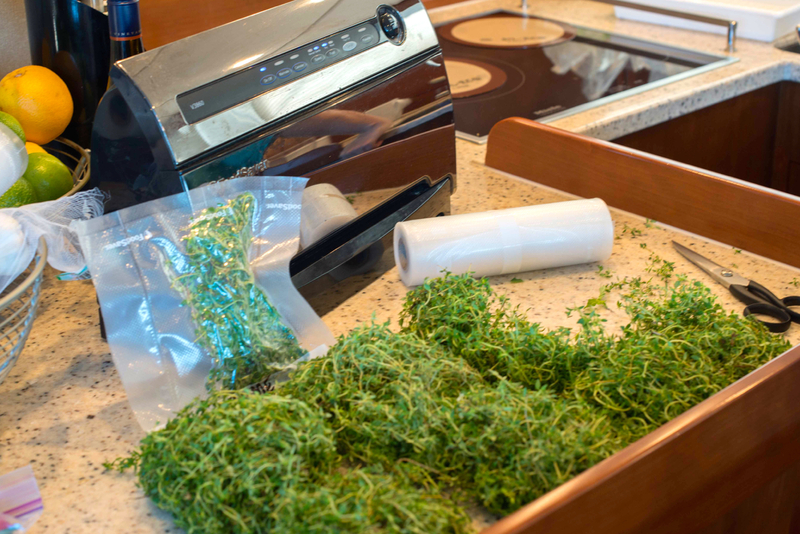 Fresh thyme freezes well, and it’s easier to pluck the leaves when it’s frozen. We resolved to spend the next few days gearing up for our several-week rotation through the hard-hit Shepherd Islands to the north of us (more on that later.) 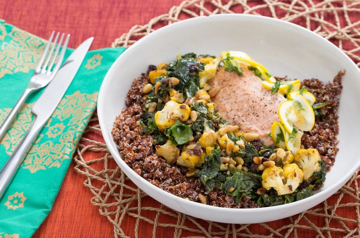 But meanwhile, that first night at anchor we celebrated our successful passage with braised New Zealand salmon seasoned Moroccan-style, with kale, cauliflower, preserved lemon, pine nuts and red quinoa. All washed down with a lovely bottle of Craggy Range Pinot Noir. Those of you who get Blue Apron (which, come to think of it, is just about everyone we know) might recognize the salmon dish, along with the shamelessly pilfered photo.) So glad I stuck some ras-el-hanout from the spice shop in Pike Place Market into our luggage. If you’d like the recipe, click here. Good to have you and Stan back on the water. With Dreamtime a mere 12 mos away from splashing at Whangarei Jacqui and I have begun to wrestle with just the issues you so helpfully touch on here ie how to get fresh produce in Fiji, how to keep fresh herbs for extended periods etc etc. So thanks for this, we’ll pick your brains a bit more as the time draws closer. Absolutely, Dennis. I’ve been tweaking that whole process over years and finally am pretty happy with the quality of what we have on hand. Those 12 months will go by in the blink of an eye! Cruising is about fixing things in exotic locations and like you we now expect that some things will not work at the beginning of the season. It is a Sherlock Holmes mystery trying to find the items that will break down before you find them but there will always be one or two evading you. I love the way you describe your outboards breakdown ” shot us the finger and stalked off in a huff”. Have an amazing season and I look forward to reading more. Thanks Mark! You have a great one, too! Gorgeous post!! Shamelessly hawking it on SetSail in the next couple of days.. Cheers.. Thank you for the update. The islands were battered and beaten but the people are tough and survivors.. Bula!